Your most important tool for helping your child be successful, well-liked and, eventually, sought after in the workplace. If you talk with employers, you are likely to find the single most maddening problem they have in common is: their employees are driving them crazy with tardiness, stealing, lying, vandalism, refusing to follow instructions, goldbricking, breaking agreements, rudeness, vulgarity, cursing, and lots of other dreadful behaviors. "Ethics are the ancient rules of conduct which help create success in one's workplace and personal life. Ethics is what makes all good things possible." If you believe a sizable part of the population no longer knows right from wrong, it's not your imagination. A revealing study by sociologists has found that fully 34% of young adults do not know right from wrong, and a large portion of the rest of the population doesn't either. 1 In many cases, even highly intelligent ones don't know. It's appalling. It's chaos. Here is how to keep your own child or children from being engulfed by the turmoil. We will explore and explain what went wrong in our society, then give you a simple three step process to remedy it in your own family, so that your children will stand out as honorable people with good ethical judgment. (B) Right and wrong are independent of anyone's opinion, and there are fixed, knowable and ancient rules that no individual or group should break? Ethics Solutions® believes millions have consciously or unconsciously chosen A, and A is what is taught in nearly all schools. We choose B, and we offer a course of instruction that will help you absorb these fixed, knowable and ancient rules into your own life. The course is designed to be completed in as little as three hours, using our three step process. These rules have been used since ancient times, because they work. There is a set of fundamental ethical principles agreed upon in all times and places. Examples are, don't steal, don't lie, and do what you say you will. These rules are essential for civilization to function. This means, among other things, they are essential for businesses and all other forms of organization to be successful. Equally important is how to think about these rules — how to use them as tools to handle situations we run into each day at work, school and the rest of our lives. At one time, these rules, and how to think about them and use them as tools, were taught in all schools, both public (meaning government-owned) and private. But the rules had been extracted from religions, which was a problem. In two decisions, in 1962 and 1963, the Supreme Court decided that in public schools, where most children are raised, it would henceforth be illegal for government to teach religion. Certainly this was a good decision, because whose religion should the government teach? There are hundreds. But forbidding the government to teach religion threw the baby out with the bathwater. As religion departed the classroom, ethics went with it. By the 1970s . . .
…educators recognized that something in the schools had gone terribly haywire. In 1972, they reacted by beginning a nationwide movement to teach Values Clarification. VC is intended to promote tolerance and respect for others. As Henry David Thoreau said, everyone is entitled to march to whatever drummer he hears. But VC can lead to the impression that all truth is just a matter of opinion. And, that has led to the belief that right and wrong are just matters of opinion. Ethics Solutions does not believe Thoreau was mistaken, but he should have added, within limits. That's what Ethics Solutions is about. All cultures have always held that there are limits that apply to everyone [except for children below the age of reason], and we teach these limits. The majority of teachers are raised in public schools, so most of them in the classroom today received little instruction about right and wrong. Parents were similarly left in the dark. So, very few adults now are equipped to instruct the children. In short, when it comes to discovering ethics, the helpless are being led by the clueless. In 1985, California Superintendent of Schools, Bill Honig, wrote a book called Last Chance For Our Children. In it, Honig warned that the lack of instruction in right and wrong meant big trouble was coming to America. Another book of that time, Yes Virginia, There is Right and Wrong, by sociologist Kathleen M. Gow, sounded the same alarm. The article revealed that "should we lie to customers?" and "should we lie to investors?" have become not momentary thoughts resulting from pressure, but "common" policy questions! And speaking of the Wall Street Journal, even they ran an article, titled "When Is It OK To Lie?" This defined a lie as "deceiving the other person," and explained that it is all right to lie when the lie is "well-intended" or "if the person wants reassurance." "We all lie several times a day," say "researchers." There is such a thing as "a prosocial lie," that is "social grease," and "these lies smooth our interactions with others." • "I guess what makes something right is how I feel about it. But different people feel different ways, so I couldn't speak on behalf of anyone else as to what's right and wrong." • Right and wrong are "up to the individual. Who am I to say?" Smith reports that "fully one in three of the emerging adults we interviewed said they simply did not know what makes anything morally right or wrong." The founders of Ethics Solutions are former teachers, and they know what many parents don't: children in school are not raised by the teachers, they are raised by their peers. A teacher simply does not have the time to give more than a few minutes per day of focused one-on-one attention to a child. But the child's peers have hours per day they can spend influencing your child's beliefs and behaviors. Usually, they know the child better than the teacher does. They know where the child is vulnerable. This means they know how and where to apply pressure, to elicit the behavior they want from the child. Schools are peer pressure cookers. A parent's only defense against the peer pressure is to build character in their child, so that the child can stand independently on his or her own two feet and resist the pressure. Clearly, the bad behaviors we see in our daily lives are symptoms of a nationwide plague. Ethics Solutions has become convinced that parents are now desperate for a way to teach what is right — to build character. There is a body of ethics at least 25 centuries old that is extremely simple and easy to learn. Until the 20th century it was used as the bedrock of American tradition and law. Step One: The teaching of this system of "eternal and immutable law" to American children was originally spread across at least six years of education. For instance, the 1920 edition of the McGuffey's Fifth Grade Reader contained the articles, "Do Not Meddle," "Control Your Temper," "Sowing and Reaping," and "The Character of a Happy Life." 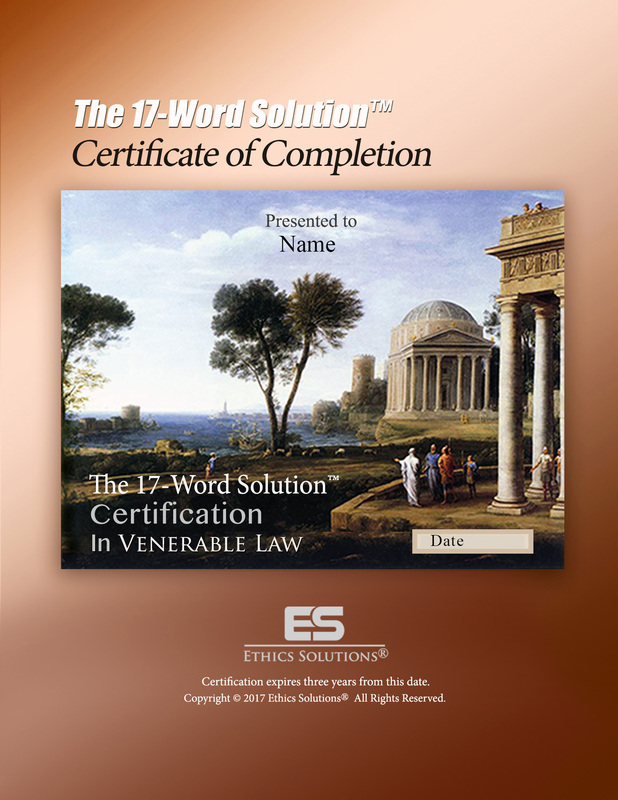 We at Ethics Solutions have condensed the six years of ethics instruction into a single small, easy-reading booklet called The 17-Word Solution.™ This handbook is the first step toward solving your ethics problems; every parent should read it, and require that their children read it, too. This takes only about two hours for someone who reads at an eighth grade level. Yes, six years of enlightenment in just two hours. Step two: The Ethics Solutions® Assessment helps you evaluate how well you and your children absorbed The 17-Word Solution.™ It usually takes less than 30 minutes and is given online. And please think about this: if you do not teach ethics to your children, who will? If the need for teaching ethics to children as a regular part of their training is so obvious, why aren't schools already doing it? We suspect because schools are afraid teaching ethics automatically means teaching religion, and they will get in trouble with government regulators. But the two subjects can be kept apart. Using theology to support an ethical rule can work, but it is not the only way. Another is to show the child the bad things likely to happen to him or her when a rule is broken, and the good things when it is obeyed. The 17-Word Solution™ takes this pragmatic approach. 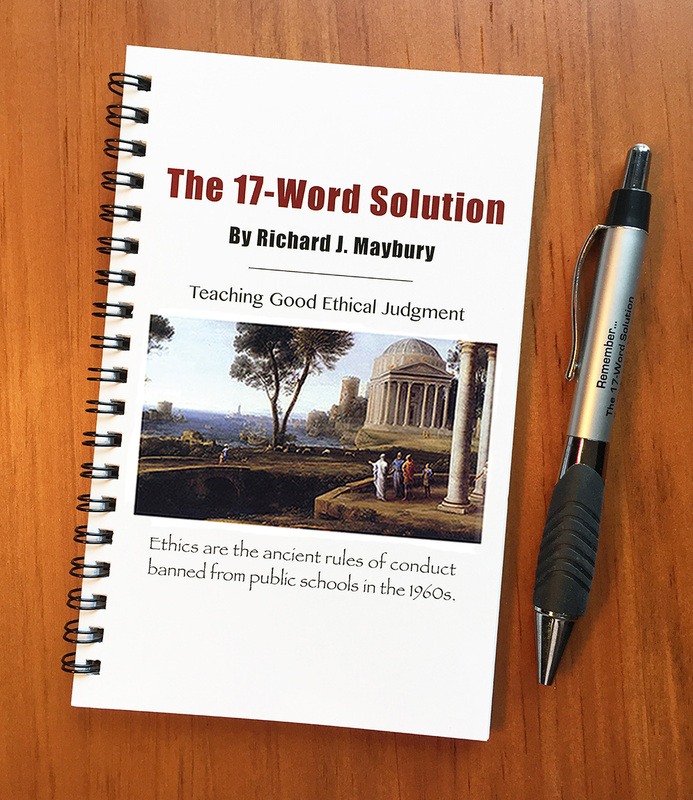 Richard J. Maybury began working on The 17-Word Solution™ over 30 years ago, and published it in his book Whatever Happened to Justice in 1992. Over the years, we at Ethics Solutions have heard from many people who have learned and used these rules exclaim, they work! After a child has read the handbook, . . .
…he or she takes the 40-question multiple choice assessment electronically. It is instantly scored, and the results are reported to the parent and child. If the child has demonstrated proficiency, a Certificate of Completion is immediately issued to him or her. This handsome, impressive, full-color certificate gives the parent and child a sense of pride and confidence so that, in the face of troublesome peer pressure, the child will stand his ground and do the right thing. If the child did not achieve proficiency, he or she can review the handbook and go through the assessment again. It may only take one unethical act to stain a young person's character in the sensitive years of his or her life. But a child who has a reputation for always behaving ethically is golden. The 17-Word course of instruction yields a depth of understanding about ethics that you will not find anywhere else. People who have this depth are noticed and sought after, because these days, they are unusual, remarkable, and impressive. In other words, people with a deep understanding of ethics have a competitive advantage in every part of life, from getting a good job, to running a successful business, to finding and keeping a partner. When you finish the course, you will be amazed. You will want everyone who touches your life to take the course too, because this will make your personal life more easy and enjoyable, we promise. 1 "IF IT FEELS RIGHT…," NY Times website, September 12, 2011. 2 "Parenting in the Age of Awfulness," WALL STREET JOURNAL, December 18, 2015, p. A15. 3 WALL STREET JOURNAL, November 23, 2015, Small business Section, p 1. 4 From the November 23, 2015 WALL STREET JOURNAL article. 5 "If It Feels Right…," by David Brooks, NEW YORK TIMES website, September 11, 2012. 6 THE AMERICAN TRADITION, by Clarence Carson, Foundation for Economic Education, 1979, p.42.